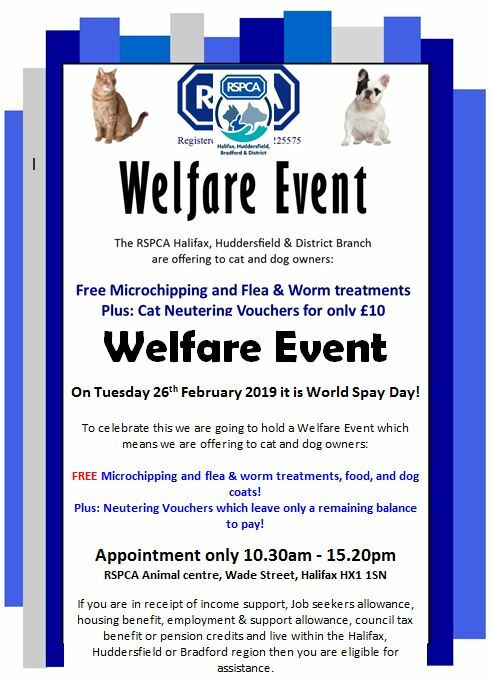 Tuesday 26 February 2019 it is World Spay Day! FREE Microchipping and flea & worm treatments, food, and dog coats! Plus: Neutering Vouchers which leave only a remaining balance to pay! If you are in receipt of income support, Job seekers allowance, housing benefit, employment & support allowance, council tax benefit or pension credits and live within the Halifax, Huddersfield or Bradford region then you are eligible for assistance. Please Note: Proof of benefit will be required and all dogs must be on a collar and lead and cats must be contained in a secure basket or you will be turned away.